l-Ascorbic acid (AsA, ascorbate or vitamin C) is the most abundant water-soluble antioxidant found in plants. Ascorbate is synthesized via four pathways involving d-mannose/l-galactose, d-galacturonate, l-gulose, and myo-inositol as main precursors. In addition to protecting plant tissues from damage caused by reactive oxygen species produced through normal oxygenic metabolism or those generated from biotic and abiotic stresses, ascorbate is also an enzyme cofactor and a modulator of cell division, cell expansion, flowering time, and gene regulation. Plants that are deficient in ascorbate are affected in multiple ways including alterations in cell division, cell expansion, seed germination, growth, floral induction, and photosynthesis. 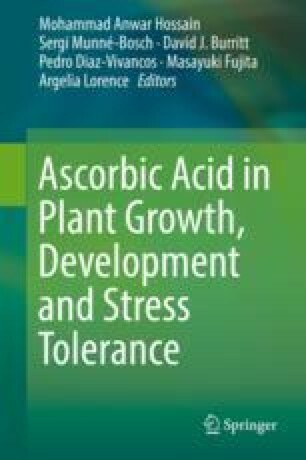 Additionally, elevated ascorbate content in plants leads to an increase in their nutritive value, lengthening of their shelf life, enhancement on their growth rate and biomass accumulation, and to an increased tolerance to multiple abiotic stresses including salt, cold, heat, and water deficit. Increasing the productivity of crops is imperative to satisfy the growing demand for food, feed, and fuels in the world, and biotechnology can lead to the development of plants with higher yields capable of thriving under adverse conditions. To this end, phenotype screening and characterization of a large number of plants experimentally obtained is time consuming and requires a significant amount of resources, skills, and expertise. In this chapter, we will present an overview of how the use of high-throughput phenotyping or phenomics is revolutionizing the way plant phenotypes are characterized and will illustrate the power of digital phenotyping in the characterization of plants overexpressing enzymes in the inositol pathway to ascorbate.